Happy 2015! I hope your holidays were wonderful and that you’re starting the new year well-rested and ready to tackle the world. I know I am. I’m back to work today after a much-needed two week holiday staycation and I hope you’re ready for a whole bunch of excellent recipes that happened in that time. If you missed my 2014 favorites posts, you can catch them here and here. 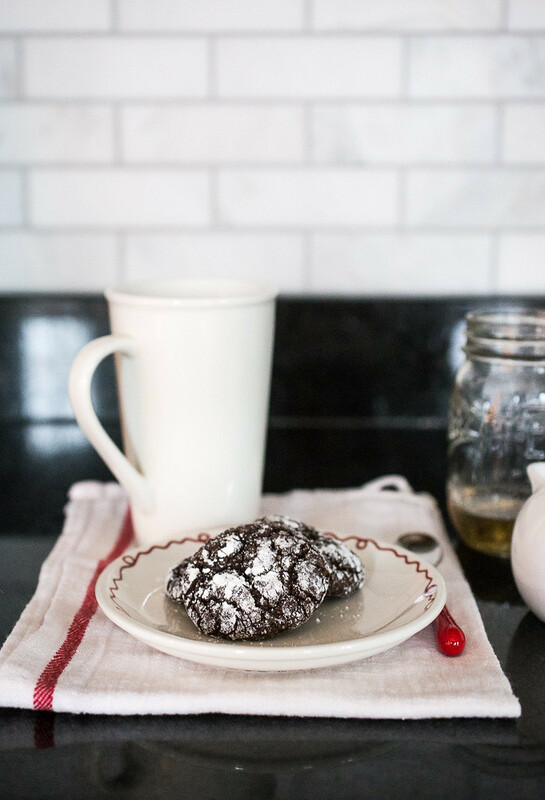 But for now, we’re starting the new year off with these chocolate crinkle cookies. Everything in moderation, right? 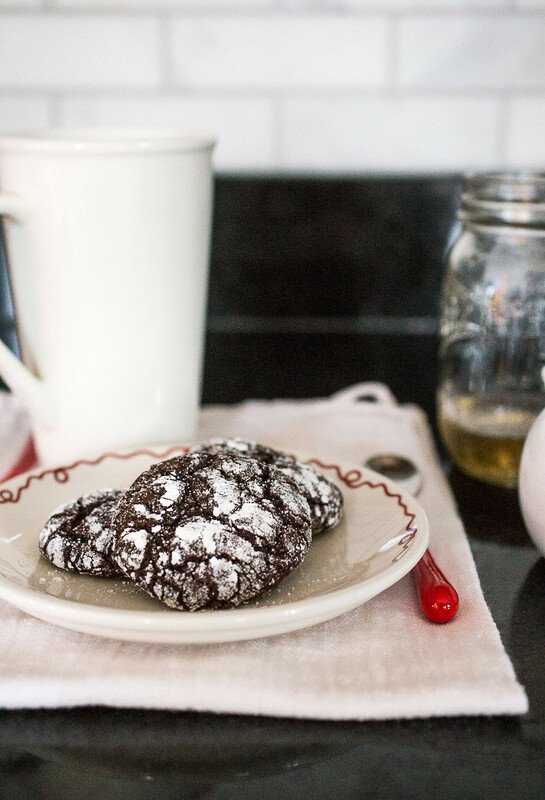 While I saw them all over the web before Christmas, these chocolate crinkles are definitely not solely Christmas cookies. The dough is a soft and sticky one that produces a brownie-like cookie with an ever-so-slightly crispy exterior from a pre-bake roll in granulated and powdered sugars. And a decent amount of espresso powder essentially makes them the perfect cookie. The crackly, crinkly exterior is a result of rolling the dough balls in the sugars so don’t be tempted to skip these steps – it’s what makes the cookie! Of the three cookie recipes I made this year (see also: thick and chewy chocolate chip with holiday M&Ms and Lofthouse-style soft frosted sugar cookies), these chocolate crinkle cookies were definitely my favorite and I know they’ll be happening again before next Christmas. These crackly chocolate crinkle cookies are some of the best cookies out there! This recipe will yield only 22 cookies but it doubles very easily and turns out a big batch of delicious and rich brownie-like cookies. Preheat oven to 325° F with a rack in the center of the oven. Line two baking sheets with parchment paper. In a medium bowl, whisk the flour, cocoa powder, baking powder, baking soda, and salt together; set aside. In a stand mixer bowl, whisk the sugar, eggs, espresso powder, and vanilla together. Heat the chopped chocolate and butter together in the microwave at 50% power for 30 second intervals, stirring after each interval, until the chocolate is melted and combined with the butter. This should take 2-3 minutes. Pour the melted chocolate into the stand mixer bowl and whisk it into the sugar-egg mixture until combined. Using a rubber spatula, fold in the flour mixture until no streaks of flour remain. Let the dough sit at room temperature for 15 minutes. Place the granulated and powdered sugars in separate shallow dishes. After the dough has rested, scoop out dough balls with a small cookie scoop (about 2 tablespoons) and roll them into balls with slightly damp fingers. Roll each ball first in the granulated sugar and then in the powdered sugar, and place them on the prepared baking sheets, evenly spaced - 11 balls per sheet. Bake one sheet one at a time for about 12 minutes, rotating 180° halfway through the time, until the cookies are puffed up and crackled. Transfer the pans to a wire rack and allow the cookies to cool completely on the pans before serving or storing. Cookies will keep well at room temperature for about 1 week. Place the granulated and powdered sugars in separate shallow dishes. After the dough has rested, scoop out dough balls with a small cookie scoop (about 2 tablespoons) and roll them into balls with slightly damp fingers. Roll each ball first in the granulated sugar and then in the powdered sugar, and place them on the prepared baking sheets, evenly spaced – 11 balls per sheet. Mmmm I love how chocolatey these crinkle cookies are! You got that right. These not just Xmas cookies. I will tell you that when I brought these cookies to a couple of Xmas events they were immensely popular. Part of the reason is that they are sooooo eye catching. Then they don’t disappoint either when you bite into one. This is so great to hear, Carol! I agree – eye catching and delicious!